Consistently rated as the “Most Livable City”, it is unsurprising that millennials, families, and large corporations alike are flocking to Pittsburgh. From the food lover, to the sports enthusiast, to the beer advocate, the number of attractions in Pittsburgh continues to grow. From the youthful collegiate atmosphere of Pittsburgh’s Oakland neighborhood to the rustic culture of Little Italy in Bloomfield, Pittsburgh’s 90 neighbors fit together as a unique assortment. Pittsburgh’s South Side, along the Monongahela River, not only is filled with great restaurants and entertainment but gives the city the highest number of bars per capita of any major U.S. city. The Cultural District in Downtown, Pittsburgh is home to theaters, restaurants, and shops that create the subtle ideas that shape Pittsburgh’s identity. Home to five museums and four city parks, Pittsburgh encourages its residents to get out and see the beauty in our city and its history. 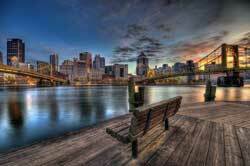 Those who choose to call Pittsburgh home share it with three professional sports teams. The Pittsburgh Pirates, Pittsburgh Penguins and Pittsburgh Steelers of the NHL, MLB and NFL respectively. With over 15 world championships between the three teams, it isn’t hard to see why we consider our city a city of champions! Pittsburgh continues to grow as a city of innovation. Business, history, sports, food and fun blend to create a unique blend that cannot be found anywhere else. The ongoing transformation leaves room for great opportunities in investment. Three Rivers Property Management, LLC specializes in assisting both foreign and domestic investors who wish to create and develop a real estate portfolio in the Pittsburgh market. Catering to each investor’s specifications, we will guide you in acquiring and developing your real estate investments. Whether it be single or multi-family properties, small upgrades or complete overhaul, the Three Rivers team is staffed to provide services from construction to leasing and management.